In this dark thriller, we follow Skye Sedgewick an heiress to a fortune as she gets kidnapped by a dark and mysterious man named Damien and held for ransom. It’s obvious that there is something more going on because while he doesn’t bat an eye for killing, he can’t seem to pull the trigger on her. Right out of the gates it’s a thrilling story as we see Skye get taken within the first chapter of the book. You know that it’s going to be a long way down from here. We follow the same journey that Skye does as she tries to reason with her kidnapper, trying to figure out A. why he didn’t kill her? B. why he kidnapped her? C. Buying time to figure out a way out. Unlike other books that are similar, Skye knows that she is falling under the spell of Stockholm Syndrome. It’s something that is well-known and I know that it bothers me at times when a well-educated woman doesn’t see the signs of falling victim to it. With that being said, it’s not something that can just be prevented, even if you are aware of it. Skye proves that by falling for kidnapper in the worse kind of way. The book is a little slow on the uptake after the big opening, but when the action begins, it doesn’t let you go until that crazy ending. It’s an ending so crazy that I don’t even think a soap opera could think of a crazier ending. When Skye finally gives into her feelings (after finding out some insight to Damien’s head) we get some very intense ‘love’ scenes. There is passion, hate, and lust pouring through their connection and the words are just oozing with it. It’s out of their relationship that we get the point of the story. That love can conquer hate and vengeance. Damien is so filled with hate and getting revenge, that he doesn’t open up to the idea of love. Skye changes that and she proves to him that there is more to life. While it’s a dark love story, it does have characters that you will be rooting for (even the bad guy). It’s about how hate and vengeance can consume you if you let it, but if you open yourself up to more, there can be more to life. You can keep up to date on news from Leylah Attar by going to her Facebook page, her Website , her Goodreads page, or her Twitter page. 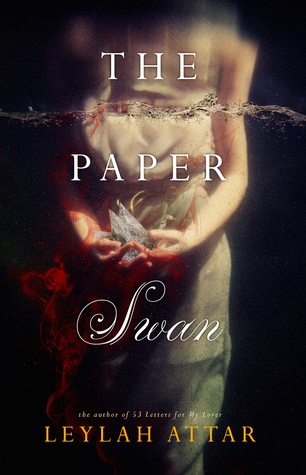 This entry was posted in Books and tagged Goodreads, Leylah Attar, The Paper Swan.